Hay-Hutch Ltd. is committed to protecting your privacy and maintaining the security of any personal information received from you. We strictly adhere to the requirements of the data protection legislation in the UK. When you order, we need to know your name, address, e-mail address and card details. This allows us to process and fulfil your order. You have the option to withhold personal information that is not required for the order process. We use your personal information to notify you of your purchase and to send you updates of our products and services. We will only contact you with your consent. We do not sell, rent or exchange your personal information with any third party for commercial reasons, beyond the essential requirement for credit/debit card validation during purchase. We do not collect sensitive information about you except when you specifically knowingly provide it. 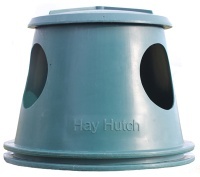 In order to maintain the accuracy of our database, you can check, update or remove your personal details by logging into your account or by e-mailing info@Hay-Hutch.co.uk. In order to process credit/debit card transactions, the bank or card processing agency may require to verify your personal details for authorisation outside the EEA (European Economic Area). Your information will not be transferred outside the EEA for any other purpose. If you have any questions about privacy, please contact us at info@Hay-Hutch.co.uk. There's a Hay Hutch to suit you . . .
Suit larger stables, yards and paddocks. Holds three quarters of a small bale. "I bought my Hay Hutch last year and it was excellent throughout the winter. I was able to leave my horse out longer than previously knowing that his hay would be protected from the rain and wouldn't get blown away. Others at the yard thought I was mad as the Hay Hutch is quite expensive but I think it is well worth the money, I have saved on wasted hay and had a happier horse due to him being out in the field longer." The small hutch holds plenty of hay for a single horse and I simply top it up in the field as and when it needs to be refilled. is really easy to move around the field as it’s not heavy at all, (I can do this on my own). Gone is the damp strewn hay all over the field that ends up on the muck heap! I now have a tidy field, hardly any waste, (gonna save a fortune in hay) - and a very, very happy horse. 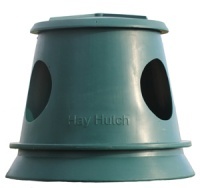 Hay Hutches are designed registered. Any attempt to copy our design for commercial application will result in legal action and full claim for compensation.